Years ago I used to visit Juarez Mexico, and always enjoyed the street vendor tamales. Later on, I remembered eating those tamales on the street, with Mariachi music pouring forth from a nearby tavern and enjoying the excellent Mexican beers (Cruz Blanca, or Carta Blanca). So, one time I bought a can of tamales and put it in my cupboard. One night I took it out, removed the wrappers and mixed it with a can of corn kernels, some sautéed onion and green pepper, and mixed in a little bottled salsa and some oregano. The whole family really liked it. When you need a quick meal it’s very easy. And of course, you can tweak it as you choose. 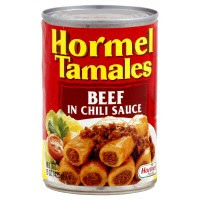 Recently a friend said,” I always have a couple cans of Tamales on hand. It is great for breakfast.” Here’s a recipe which is convenient for holiday mornings, because it’s like a casserole. · Drain tamales, reserving the sauce from the can. Remove the wrappers. · Beat eggs, milk and salt in a bowl and set aside. · Melt butter in large skillet over medium flame. Add tomato, chilies and onion. Cook till heated and add egg mixture. Stir gently until just barely set. · Spoon the eggs over the tamales and sprinkle on the cheese. · Broil 4 inches beneath heat briefly, until cheese melts. You can adjust for 2 servings or even just one, but give it a try, ‘cause it’s good.